"... Ten writers and artists, including Varian Johnson, Naomi Shihab Nye, and Francisco X. Stork, offer brief works of fiction and nonfiction “about the between-cultures life.” As Perkins notes, “Humor has the power to break down barriers and draw us together across borders,” and the stories within bear that out... 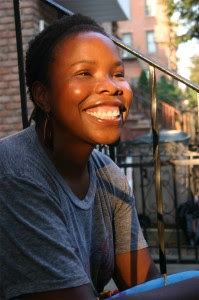 Most offer a subtler, uncomfortable brand of situational humor: Olugbemisola Rhuday-Perkovich calls her high school 'an oasis of suburban racial integration'; when the drama club performed The Crucible, 'the drama coach was sensitive enough to ask the black members of the troupe if we’d be uncomfortable playing the role of slave Tituba.' ..."
Here are the opening lines from "Confessions of a Black Geek," her memoir in OPEN MIC. Don't you want to keep reading? Find out more about Gbemi's award-winning novel 8th Grade Superzero, which was named a Notable Children’s Book for a Global Society and a Notable Social Studies Trade Book for Young People. You may also eavesdrop on a chat between the two of us here on the Fire Escape. "I was the new kid at school many times over, in more than one country," says Gbemi. "I now live with my family in Brooklyn, where I write, make things, and need more sleep."